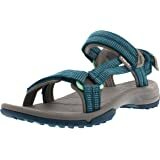 Fit as expected, color a little lighter than pictured, but that's okay, can't go wrong with Teva's! 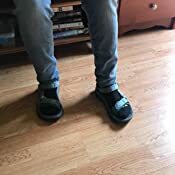 Very comfortable, fits perfectly and looks great This is to replace the pair I have had for over 20 years. They are incredibly comfy, held up for the full month of abuse I put them through, and worked well even in the storms. 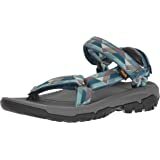 5.0 out of 5 starsLove Love Love my Tevas! 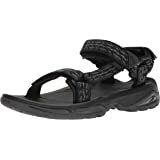 5.0 out of 5 starsSo Far I Love These Sandals!!! 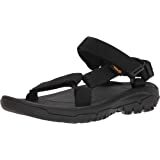 I've had these sandals for almost a week now,and they are soooooo cute,and most importantly,very very comfy :) I purchased this pair for $25 dollars cheaper than the Teva website! I LOVE the colors,as purple shades are my favorite! 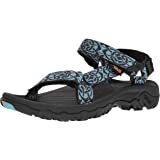 They are so cushy as you walk,and they really feel fantastic on your feet!!! 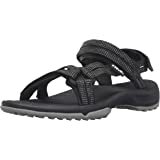 My family goes camping in the summer,so we do alot of walking,and bike riding,and i plan on taking these with me for sure....and possibly buying another pair as well :) I will update this review if anything changes..I'm always a size 8-8+1/2 and i purchased the 8, and they fit great! Totally adjustable which is a huge plus!!! 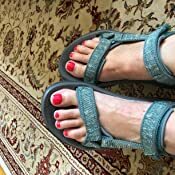 My feet; Measure a size 7, but frequently wear a 7.5, average arches, high instep, average heel, broader than average fore foot (not enough to be able to wear wide shoes) and plantar fasciitis with tender heels (need cushion under heel). 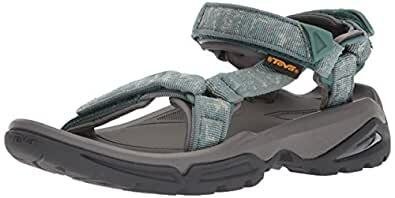 I purchased this Teva sandal to wear outside in my sloped yard after a fall on wet ground. I haven't recovered enough as of yet to test the sandal for this purpose, but the bottom seems it will have the grip I need. I find the shoe is longer and wider than I expected. I can wear them as they are, however, they are adjustable and will work nicely with thick socks for the winter (indoors). Don't laugh, please. It's not easy to find shoes that meet my requirements. If I purchase the purple pair it will be in size 6.5 for warm weather wear. I find the foot bed cushy and even when strongly pressing down with my heel, I don't experience pain. I think the arch support will work for me. If you have plantar fasciitis, you need to wear shoes with high arch support even if you don't have high arches. Seems sturdy enough to take some abuse. No breaking in required. These are the most comfortable shoes I've EVER owned. I have extremely high arches and cannot wear anything where traditional lacing (as in tennis shoes) hits my feet. I also have extra-wide feet and one foot is a half size larger than the other. I cannot wear flats of any kind without extreme discomfort to my back and feet. The fact that these shoes can be adjusted in three different places made all the difference to me. 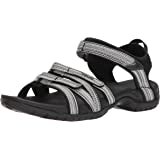 For the first time, I am wearing a comfortable sandal and one that I can walk for miles in without foot fatigue. I can't believe I waited 61 years to buy a pair of these and now I don't think I'll ever wear anything else. I'll be the Socks with Sandals Gal in the Winter, for real. 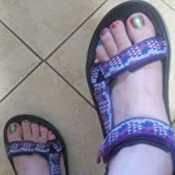 Most excellent shoes and I cannot wait to try other Teva products. 5.0 out of 5 starsI. LOVE. THESE. SANDALS! 5.0 out of 5 starsWorth every penny...Terrific sandals!! I have GOT to rave about these sandals! 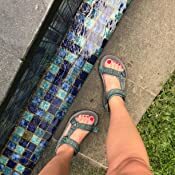 I have had my Tevas for many years, and after ordering and returning the cheaper versions of these sandals which were harder on the feet, I was almost convinced that "they don't make them like they used to". 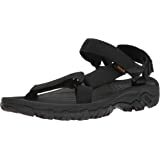 But after I had these, it's that same comfortable fit I remembered; and more so from these top-of-the-line Tevas. I want to bring them everywhere to change back into them--and like another review, I agree that they are comfortable right out of the box. I also agree that they are spongy, yet firm and solidly built--they may seem wide (at first I thought the "W" on the box meant 'Wide", but it doesn't)--I believe they are made this way to cradle and protect the feet...I can walk effortlessly in them! They're also beautiful.